Alien Cruiser Applies Exterior Covering While. 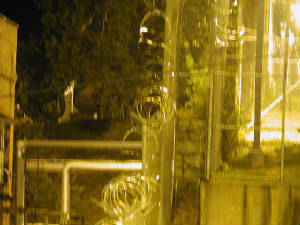 far right upper fence covered with cloaking material - CLICK to enlarge. @ Jefferson City, MO CLICK to enlarge. Jefferson City, MO, CLICK to enlarge. 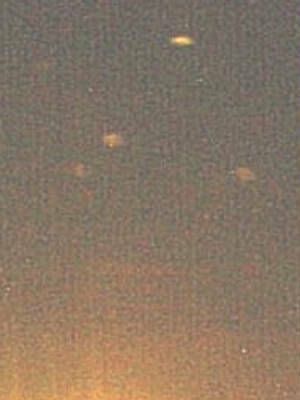 *Double stacked UFOs @ the ABO. It was another beautiful night in the early fall of 1999. I was on duty in tower #10 and could see out across the Missiouri River Bottoms. I couldn't see any stars that night but otherwise everything was just right. As I looked out across the low lands of the Missouri River Bottom farmland I saw two air born lights coming my direction. They seemed to be more than a mile away when I first saw them. They were flying very low and slow. Actually they were below the surrounding terrain as the river bottom farmland sets quite a bit lower than the small hills that surround it. The lights were coming directly toward me and I watched them intently while trying to gauge their speed and figure out what kind of aircraft this might be. When they were close enough I could determine that these two yellow lights were rectangular in shape. As they approached it seemed that they were slowing down but because they were coming directly towards me I couldn't be sure. Their speed had to be less than fifty miles per hour. 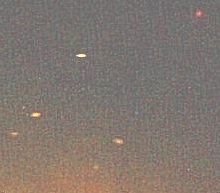 These observations did not fit in with any aircraft that I knew except for maybe a helicopter and these were not normal aircraft lights. There was no sound of any type of aircraft. The lights were rectangular in shape and had a yellow glow. As they approached I tried to estimate the size of the lights. They were very large. When they were very close to me I guessed their size to be about 3 to 4 feet high and approximately 12 to 15 feet in length. 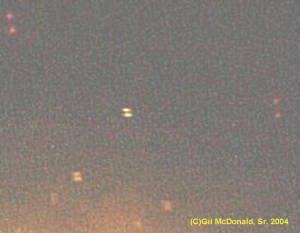 The two lights were both horizontal with one on the left and the other on the right of whatever craft they were on. There was a space of 5 feet or more between the two lights. I watched them intently as they approached. When they passed over my head they were less than 50 feet above me and traveling at the very slow rate of about ten miles per hour and each large, long yellow light seemed to be made up of dozens of smaller yellow lights in rows. There were maybe 10 + or - rows of smaller yellow lights that made up the horizontial rectangular lights. The height above me was (ONLY) 50 feet, folks. That is less than 17 yards. The part that really caught my attention was that I could hear no sound of any kind of aircraft and I could see no shape or structure or evidence of any type of aircraft, just the two lights. 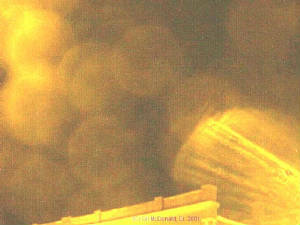 After they passed directly over my head I could no longer see the lights or any glow coming from them. There was no sign of any type that there were additional lights in the area. I could see no light pattern on the ground as the lights moved past me. There was no glow in the air from the lights. Everything returned to the light pattern that existed prior to first spotting the lights and the air above me returned to darkness. I could not see any body shape or shadow of any kind of craft nor could I hear any sound of a craft. I looked for a heat signature of any kind of engine that might create heat such as a jet flame or heat vent or anything like that. I could see nothing but the dark sky. 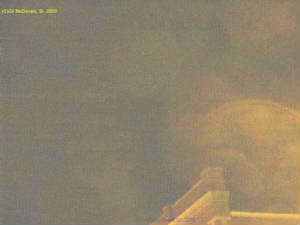 I am sure, of course, that it was a UFO, but I did not even have a camera with me. I have wondered many times since if that thing had parked right above my head. If it did I could see no evidence that it was there. 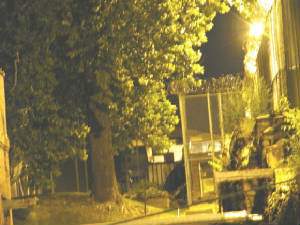 After that I started doing some research in the area and taking a camera with me. I would give a lot to have that happen again so I could get some photos? Some may wonder why I use the term 'cloaking' so freely. After something like that, (and seeing the shuttle craft become invisible and then visible again a few minutes later) I can easily understand that, whatever it is, they do have a cloaking capability. It was another one of those really great mystery experiences that I have so often experienced since studying the UFO enigma in the area of the ABO.